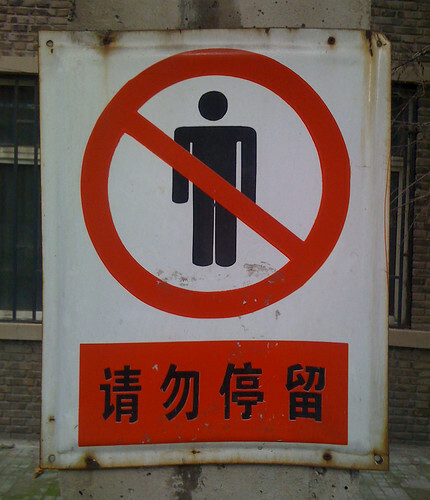 At first, I thought it said, “No Black People Allowed”… but then I figured it out. What do you think it means? I’m back in Tianjin and, honestly, not loving it yet… “Tea and Gin” is just one of those cities that needs to grow on you. And it’s taking its sweet time this round. Oh well? Let’s focus on the past 2.5 months, instead! This summer was grand / busy / emotional / wonderful / sad / whirlwindy / needed / crazy / too short / worth it. Insert whatever adjective you want and it probably describes it perfectly! In an unexpected turn, I actually didn’t want to return to China. (Don’t worry, I did anyways.) I had a fabulous time with my family and friends and just didn’t want it to end. Alas, it was time to come back and continue my life. *Leave a comment with what we did together this summer so we can always remember… and make notes for next summer. Did it still feel like home? Tough question. The house I “grew up in” was long sold, my sister had moved out, and my dog had gone where all dogs eventually go… in that sense, it wasn’t really home. But my family was still the same, my friends and I picked right up where we left off, and Minneapolis was basically how I remembered it and loved. I just need to learn how to have two homes now. The first day back, a soon-to-be friend pointed out that I used very simple English and a lot of hand motions and verbal cues when I communicated. He guessed that I must have lived in a foreign country before. Little did he know, I had just returned from one! And another time, I pulled out some hand sanitizer before a meal (a must here in China! ), and my friends looked at me strange and got a good laugh at my expense. All in all, I’m still an American – I just don’t act and speak like one much anymore, I suppose. Get everything done you wanted? Some good friends lent me a car, a bicycle, and a record player, and I was so thankful to have those tools to help make my summer more accessible and awesome. I don’t know what I would have done without them, actually. I had many meals, coffees, and walks around parks. I got to go up to my friend’s cabin on Lake Vermillion, MN, for a few days. I watched and participated in friends’ summer sports leagues. I got to see so many wonderful concerts, including a truly American bluegrass show at least every week. I had a couple weddings to attend. A bad run-in with Americanized Chinese food. I had a memorable day-long roadtrip to Wisconsin. I saw a show at the Guthrie Theater. I saw a MN Twins game at their new stadium. Lots of grilling out on my friends’ decks. Outdoor movies. A Chinese language and culture tutoring session for a business consultant. Lots of shopping for a needed wardrobe. Seeing people I didn’t expect to see. Meeting new babies. Making new friends. But no, I didn’t get to do everything. And there were many people I didn’t get to see, either… all I can say about that, though, is start planning for next summer! Besides readjusting to the wasteland that is Tianjin, I’ve had a great time reconnecting with my friends here and seeing how much of my Chinese has sunk into my language learning iceberg. I’m teaching at the same university again this year, so my mailing address remains the same… hope that helps! Some of my students actually signed a petition to get me back and the admin gave me a nice little raise so I can live off-campus. I will be living with a like-minded New Zealand guy who’s been here longer than I have and who’s known to be an excellent cook. I’ve only been moved in for a week, but I can vouch that this is accurate. Should be a great relationship! As long as I continue to do the dishes, I’m guessing. I apologize for my poor English skills ahead of time… I’ve really immersed myself in Chinese this semester and my native language has definitely taken a nose dive. Don’t tell the university where I teach English! They’ll never know. After almost two years of life in China and travels to North Korea, Western China, Vietnam, and Bangladesh, I’ve decided to spend a holiday back home with the people that care about me the most. Please check your calendars and let me know when you’d like to meet up… I’d love to catch up on your lives and, of course, share about mine. If you have a small group or a big group that wants to hear about “overseas life,” I’d definitely consider sharing with them, too. Ask me anything! When and where will you be? I’m arriving home to Minneapolis, Minnesota, at the end of June, to firstly spend some quality time with my family and friends for a few weeks. I’ll be traveling to Washington, DC, to spend some time with various friends on the East Coast maybe in August? Back to Minnesota for the end of August. There will be a weekend somewhere when I go to Chicago. Maybe spend a weekend up north at a lake. Maybe short trips around MN and surrounding states? Any road trip ideas? I will head back to China by September. Make sure all of our adventures are completed before then. I’m afraid my time home will go by way too quickly. What will you do whilst home? I can tell you what I won’t be doing: having dinner with three beautiful Chinese girls at the same time! Hey oh! It’s possible, but unlikely. Anyways, my options are really endless. What else would someone who hasn’t been in America for two years want to do? And to be frank, I won’t have too much money to spend this summer, so if we’re deciding between things, I’d prefer the cheaper option… You know what I mean? Thanks. Good thing it doesn’t cost anything to just hang out! Does anyone have an extra car I could use for a couple months? In Minnesota or DC? How about a two-month SIM card for my cell phone? Any spare frequent flier miles laying around? Who’d like to fill me in on recent pop culture/politics? Anybody know a cheap doctor and dentist to get check-ups at? My Chinese insurance won’t cover things in the States. How about a counselor? Being home might be a tad bit overwhelming. Does anyone have a record player I could borrow for the summer? I sold mine before I left, but saved my favorite vinyls. Oh, and I’m thinking about taking up the banjo.. Anyone have one they don’t want? A few people have asked what to send me for my birthday this year, so I thought I’d post another little list for everyone. It’s April 9, so that gives you a few days to get a letter or package or email together… I’d love to hear from all of you! Also, there’s a wishlist on Amazon, if you’d like to browse it. How about you? What were your favorites from the past year? It’s easy to get arrogant when learning a new language and I tend to celebrate at every small accomplishment. But on the flipside, it’s also easy to get quite frustrated when you don’t understand the simplest thing. Oh well. Once upon a time, an old farmer planted a plot of rice. Everyday he went to the field to watch the seedlings grow. He saw the young shoots break through the soil and grow taller each day. 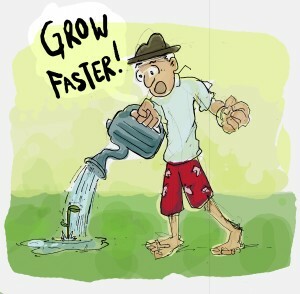 But still, he thought they were growing too slowly. He got impatient with the young plants. “How could the plants grow faster?” He tossed in bed during the night and could not sleep. Suddenly, an idea popped into his head! His idea could not wait until daybreak. He jumped out of bed and dashed to the field. Under the light of the moon, he began working on the rice seedlings. One by one, he pulled up the young plants by half an inch. When he finished pulling, it was already morning. Straightening his back, he said to himself, “What a wonderful idea! Look, how much taller the plants have grown in one night!” With great satisfaction, he went back home. In a triumphant tone, he told his son what he had done. His son was shocked! By this time, the sun had risen, and the young man was heart-broken to see all the young plants dying. People now use “ya miao zhu zhang” to describe the behavior of those who are too eager to get something done, only to make it worse. Time to give my Chinese tutor a raise. 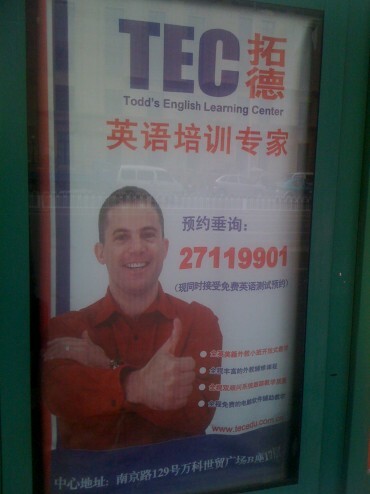 Who would want to study from a guy named Todd, anyways!? You know you stand out from the crowd if you get interviewed for a big magazine in town when you haven’t even been here 3 months. Well, that’s what happened to me. I met one of my good Chinese friends, Jonathan, on the subway. Apparently, he knew I was a foreigner right away. (How could he tell!?) This was back in December and I found out he had just gotten a job at Tomorrow Magazine – “An Extensive Living Guide for Foreigners in Tianjin.” In January, he wanted to interview me. I only found the publication recently. Daniel Konold, a big boy from Minneapolis, Minnesota, USA. Before moving to Tianjin, he worked with computers in support and design. He loves travelling. So far he has been to over 20 countries covering almost all continents on the earth. For leisure time, he likes basketball, American football, and rugby. 1. Why do you choose Tianjin as destination? Actually, I didn’t choose Tianjin, Tianjin chose me! The company I work for places me in different cities around China, and Tianjin happens to be the city they chose for me. 2. How long have you been living in Tianjin? I’ve been living in Tianjin a little over 3 months. 3. What do you do here? Here in Tianjin, I’m an English Teacher and a Web Designer. 4. Did you feel difficult living in Tianjin when you just arrived, for instance? No, it wasn’t difficult at all to start living here. I think Tianjin is a good transition city with many similar things to my hometown, but still different enough to feel new. 5. How do you like Tianjin? Tianjin is not my favorite city in the world, but it’s a fine city to live in. The public transportation is very easy to use and I can find most food from around the world whenever I feel like it. 6. What do you think about Tianjin locals? Tianjin local people have been very nice to me, personally. Since the first day I arrived, many people have offered to help me move in and find things I’m looking for. No complaints about the locals! 7. By far, what do you think about Tianjin? I think Tianjin is, by far, the biggest city I’ve ever lived in but also small enough to start to call home. 8. When the day that you leave Tianjin comes, what will you miss about this place? Mostly, I will miss the people I’ve met along the way and all the nice Tianjinians who have helped me live here. 9. Tell me something about some interesting personal experiences in this city. One of the most interesting experiences so far was going to the TuanBo Hot Springs on the outskirts of town. I was definitely the only noticeable foreigner in the spa and I got a lot of stares. Dipping into all the different liquids was fascinating and I really felt rejuvenated after the visit.